US Volunteers soldiers swimming in a river "possibly" in Batangas. Image Source: Genealogy, History and Archives Unit, Fort Worth Public Library. The photograph above shows United States Volunteers troops “possibly” in Batangas. 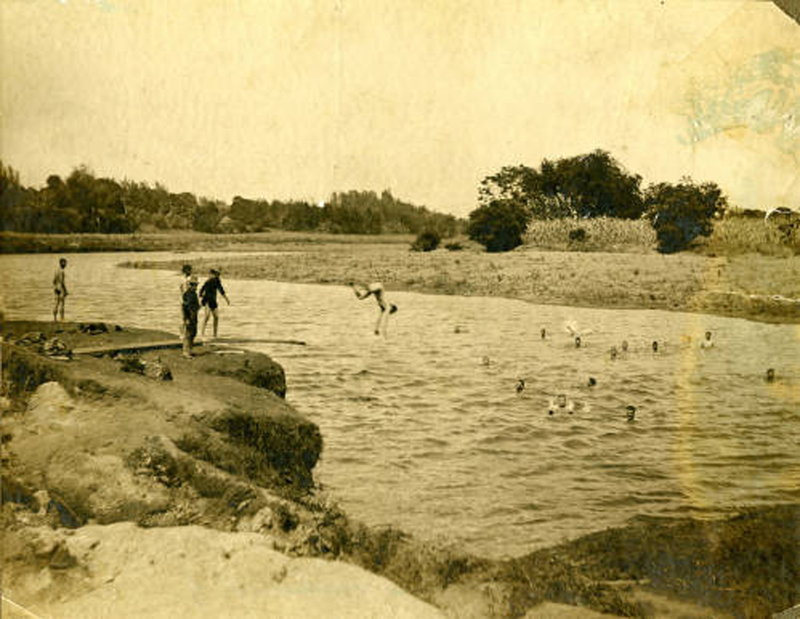 The picture has been downloaded from the Forth Worth Library Digital Archives, where it was given the title/label “Troops Swim in a River.” It is part of the library's Sandra Plummer Collection. Additionally, a description was given “American troops swimming in a river, possibly in the Batangas province of the Philippines The word “possibly” is used in most of the photographs in the collection primarily as a precaution because the archivists at the library were likely unable to establish definitively that the pictures were, indeed, taken in the province. However, most of the pictures followed the movements of the 38th Volunteer Infantry through its campaigns during the Philippine-American War, including in Batangas where it was assigned for a while. It was taken between 1899 and 1902. The picture has been processed using graphics editing software to enhance overall quality. The top picture has been colorized courtesy of Algorithmia. Below is the original sepia toned version downloaded from the Fort Worth Library, enlarged from 499 x 386 pixels to 1,500 by 1,100 pixels. The original sepia-toned version of the top picture. Image Source: Genealogy, History and Archives Unit, Fort Worth Public Library. Readers will please note that reuse of either photo in this post is restricted to educational, non-commercial or personal use only. Attribution should be made to the "Genealogy, History and Archives Unit, Fort Worth Public Library."